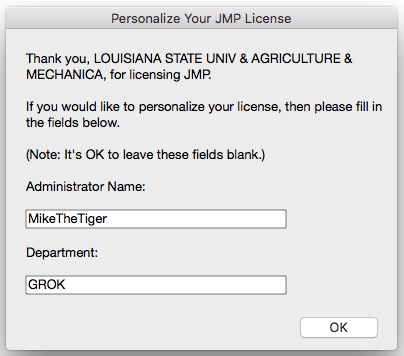 If you need licensing instructions or help, please see the Licensing & Reactivation section of JMP Statistical Discovery: LSU Overview. 1. Download the appropriate Installation Data file for your version of JMP from the download section on TigerWare. This will be necessary for activating your product. 4. 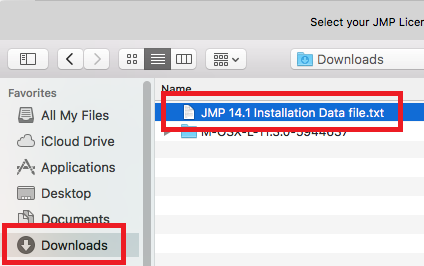 Locate the JMP activation .txt file you downloaded from TigerWare; it is likely found in your Downloads folder. Click on the .txt file then select the Choose button at the bottom right. 5. 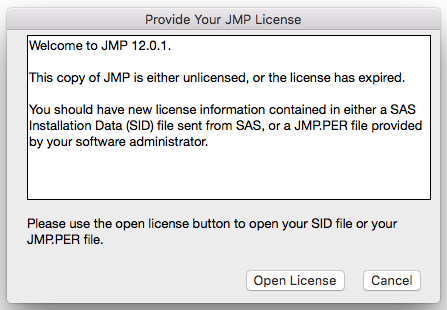 Personalize your JMP License by adding your Administrator Name and Department. NOTE: It is ok to leave these fields blank. 7. You have completed the licensing of JMP.